The early October sun and the soft blue ocean current-warmed breeze, which had been blowing southwesterly off of Derrynane Bay much of the day, had combined to make the mid-afternoon almost hot. The waters of the bay shone, then sparkled, then lay still, the tide being almost out and the wind becoming spare. The small, sturdy river ship now completing its journey down the Kenmare River towards the bay, located off of the barely accessible Iveragh Peninsula, at the remote tip of southwest County Kerry, was one of a number of vessels in the variegated fleet belonging to the O’Connells of Derrynane; the craft typically carried butter and other produce, messages and, less frequently, passengers. This day, the ship held no cargo and only two rather singular travelers: an arresting young woman and the massive black-maned, black-tailed chestnut stallion she called Bull. Reaching its destination, the shallow-draft boat’s pilot eased its bow onto a tidal-bar of soft, pungent sand. As the vessel was coming to a gentle rest, the enormous, red-headed mariner came forward from the helm and, with surprising grace, stepped off the bow, his bare feet splashing, then squishing onto the soft shore. Immediately, he turned and held open his arms. “M’lady . . . please,” he called with a smile to the very tall—six feet, and perhaps an inch—willowy girl of sixteen. A thick, gleaming mane of hair tumbled over her shoulders and down her back to her waist, as black as the full-skirted, hip-padded wool dress she wore, the hem of which she lifted ever so slightly, partially baring her calves as she stepped off the bow. Her bare toes just skimmed the water as the sailor caught her and, as they both laughed, swung her around, setting her gently down onto drier sand. Eileen O’Connell, the fifth of eight still-living daughters and the ninth of thirteen still-living children—there had been twenty-two in all—of the late Donal Mór Ó Conaill and his wife, Maire ní Dhuibh (“Big Daniel,” a name appropriate for the massive man he was, or the “Elder Daniel,” and “Mary of the Dark People,” which referred to her own colourful family, the “Fighting O’Donoghues of Glenflesk”), was returning to Derrynane. Still on deck, the wind-and-weather-worn, smooth planking warm beneath his bare feet, the young mate handed the pilot several battered leather satchels and a magnificent hand-tooled, Spanish-made saddle, which he set softly on a low grassy dune. Eileen hoisted the saddle over an arm and began to sling a bag over her other shoulder, the boat’s master taking it back. Still barefoot, and lugging her saddle now, she began to walk up the strand. The sailors then called, “Along we shall be shortly,” and as she nodded in understanding, both men, leaving the remaining luggage on the sand, hopped back aboard to lower a gangplank so as to bring the now-whinnying horse ashore. The breeze catching and playing with her hair, the young woman trudged across the warm sand, around a tide pool, over low dunes, through sea grasses, and up onto the rough grass, lawn-cut and emerald green, striding purposefully towards the cluster of buildings ahead, dominated by the massive, dark, rambling structure that was Derrynane House itself: the location, if not the building in its present form, home to the O’Connells since the first years of the eighteenth century. The feel of the warm, rough sand on her wet feet, the coarse dune grass scraping her bare legs, the sensation of the damp lawn beneath her feet, these—along with the salt-and-seaweed-laden air, itself spiced with more than a suggestion of dead fish and low-tide bay bottom—all made Eileen conscious of the reality of home. By this time her arrival had been noticed, and as she crossed the lawn, Eileen gazed on a mix of O’Connells, along with retainers, tenants and craftsmen, household and kitchen help and others who had begun to gather. Standing apart was Denis, the eldest O’Connell son, of taller-than-average height, fair of countenance, dark of outlook, and, at his side, a diminutive, middle-aged woman, the mother and matriarch of an extraordinary family, dressed in a rough, flowing gown of dark blue wool, her greying blonde hair worn loose, below her shoulders. As the broad-shouldered girl reached the level ground where the group had gathered, Denis, his pale blue eyes now squinting against the afternoon sun, called out, “Why, Nellie, you are here!” stiffly, unemotionally, and with a deliberate, calculatedly bitter measure of sarcasm. Eileen winced visibly; how she loathed that nickname. She never had understood its origin, it made no sense to her, and she was grateful only a very few of her relatives seemed to favour it, despite knowing how intensely she disliked it. In a flash, however, her expression became a grateful smile as her mother burst from the little crowd and, as Eileen dropped her saddle, enveloped her tall daughter, murmuring in a mixture of English and Irish, burying her face in her daughter’s bosom, sobbing. Just at that moment, Denis O’Connell, his expression one of utter contempt and total disdain, stepped next to the emotional pair and leaned towards Eileen. “How dare you come here?” he hissed callously. Her eyes suddenly wide, her expression venomous, Eileen unexpectedly released her mother’s hands and wordlessly shook him off with a quick, abrupt motion, as she would any loathsome creature. Her mother had, and glaring in her son’s direction, Maire stretched out to drape her left arm around her daughter’s waist, as Eileen did the same to her mother’s, and the women walked slowly away from the little gathering. Halting some distance from the women, Denis’s hard eyes glared at those remaining, as though to say Enough, be about your business now, and they quietly dispersed. Mother and daughter made their way into the house and up to Maire’s rooms, located at the far end of the second floor. 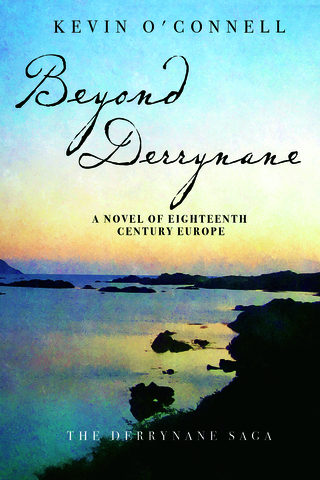 Within moments, the sound of women’s voices, though muffled by heavy doors and thick walls, resonated in the upper corridor, in a jumble of Irish and English, raised in high emotion, enveloped in a sense of anger, fear, and more tears. Eileen’s husky voice was raised now, dominatingly, “Nil, Nil!” – “No!” and then she actually screamed at her mother, now in Irish, “You would not understand – you could not understand! I cannot, I shall not tell you. . . . !” One of the inside doors in Maire’s rooms slammed and the hall echoed with wrenching sobs as Eileen pounded a wall with her fist, again and again. Eileen had stopped crying. She found the dressing room’s basin—kept filled, as were those in all of the house’s occupied bedrooms, with fresh water—washed her face and bathed her eyes, and quietly, slowly, turned and walked, still barefoot, back towards where her mother sat in a cushioned window seat, gazing out to sea. Reaching her mother, Eileen knelt silently at Maire’s feet and sat back on her heels, her hands resting in her lap—on her left one the simple gold band gleaming sadly—the folds of her widow’s weeds lying about her on the worn rug, her hair tumbling over her shoulders, front and back. Her eyes red and swollen, she looked up at her mother, whispering “Tá brón orm,” “I am sorry,” and, her shoulders shaking, she began to cry again. Her mother turned to face her, and the somehow delicate fingers of Maire’s tan, rough hand gently gripped and lifted her daughter’s chin. Looking down at the girl, she slowly nodded from side to side, her face set now. No more. Enough. A multi-layered story, rich in historical and dramatic detail, populated by an array of colourfully-complex and memorable characters, whose lives and stories play out in a series of striking settings.